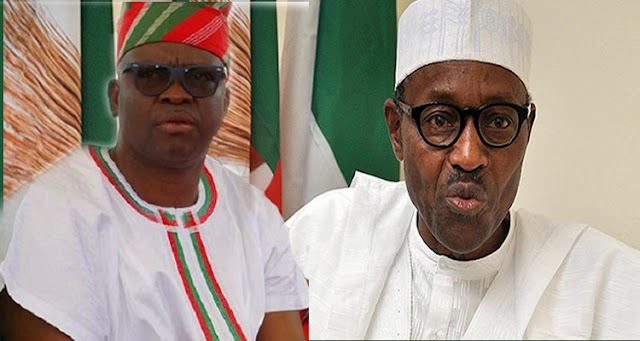 Governor Ayodele Fayose of Ekiti State has disclosed that he will not welcome President Muhammadu Buhari and his entourage to Ekiti on June 10, as requested in a letter to him. He explained that the Federal Government under Buhari did not deem it fit to construct even a 100-meter road in the state since they came into office. The governor expressed optimism that the party’s candidate, Prof. Kolapo Olusola Eleka, would be the governor-elect on July 14, adding that the president and his entourage would be disgraced in the state. He said: “I am not going to receive the president. If they think that they can use the police to intimidate us, it is a lie. This government is undemocratic, why did they close Akure Airport yesterday, when they knew that we would be receiving our party members. “They have been arresting members of the PDP, but we will not be provoked. We will disgrace all of them on June 14. He said he was aware of plans by the INEC to rig the poll, adding that they will follow them anywhere they go, even as: “we are not interested in violence. “When I saw the President of France, Emmanuel Macron and Nigeria President, I was ashamed. This country does not deserve an old man, we deserve the younger generations,” he said. Party leaders at the rally said: “PDP has been rebranded and repositioned to gain the lost grounds. We will rescue Nigeria from all sorts of inhuman treatment meted out by the APC.